José de San Martín was born in the town of Yapeyú, in Argentina. He had to leave his country at the early age to study in Spain. At the age of 20 he enrolled to the Spanish army and participated in several campaigns in Africa. He came back to Argentina in 1812 and participated in the struggle for independence of Argentina from Spain. He formed several armies and organized the plan to defeat Spanish forces in 1814. 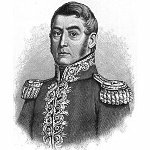 In 1818 San Martín led the Army of the Andes to liberate Сhile and Peru from Spanish colonialism. San Martín spent last years of his life in France. He died on August 17, 1850 at the age of 72. He is considered to be a national hero in Argentina. The day of his death is a public holiday. Although General died on August 17, the commemoration day is also observed on the third Monday in August.